Sit-On-Top (SOT) kayaks are easy boats on which to learn to paddle. They have none of the “get in the coffin and you are about to drown” psychological identity that one finds in the Sit-Inside boats and they’re amazingly adaptable to a wide range of paddling activities. It also doesn’t hurt that they are pretty straightforward boats to rotomold, which makes them very cheap to produce in large numbers. I didn’t envision just one boat for this niche in the home-built kayak market. Instead, it came to me that there would need to be at least three models that could address the wide-ranging styles of boating interests in this area of the kayak world. 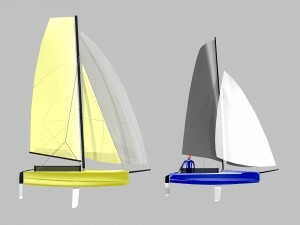 The result was a couple of very clean, SOT models at 14’ and 16’ called the Corona and the Back Bay, respectively. The third model was going to be called the Wahoo, as it was specifically designed for the folks who spend a lot of time fishing with their SOT’s. I’ll get to the Wahoo in the next article. As a canoe and kayak sailor and a guy who had just been out for a test drive on the Hobie Adventure Island, which is based on their 16’ SOT Adventure model, I wanted to offer my own take on what makes for a truly fun and stylish, sailing SOT kayak. The result was that a fully integrated system of component parts was designed for the basic Back Bay. 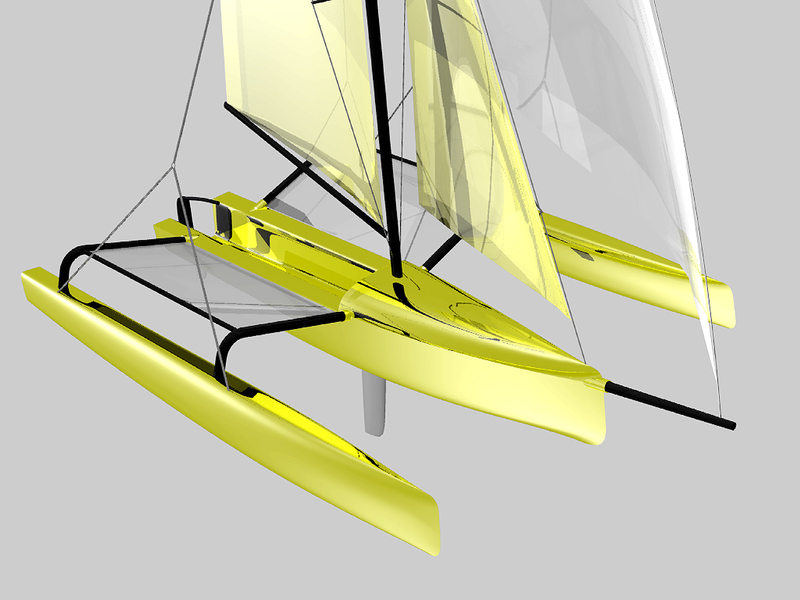 This modular approach allows the Back Bay to go sailing by simply adding a system of light-weight, easily built elements that quickly convert the SOT to a single aka sailing boat called the Scorpion, OR, to a double aka sailing boat with slightly larger ama volume, called the Doubloon. Of the two configurations, the Doubloon is most like the well-known and highly respected, Hobie Adventure Island. The Corona and the Back Bay are virtually identical models, save for their respective lengths. For the purposes of this article, I’ll focus on the Back Bay version and all the potential add-on systems I’ve incorporated in the design. This boat is built in the S&G style of construction in 4mm marine ply with 6 oz. plain weave fiberglass set in epoxy on the inside and outside of the hull for full laminate sandwich strength. 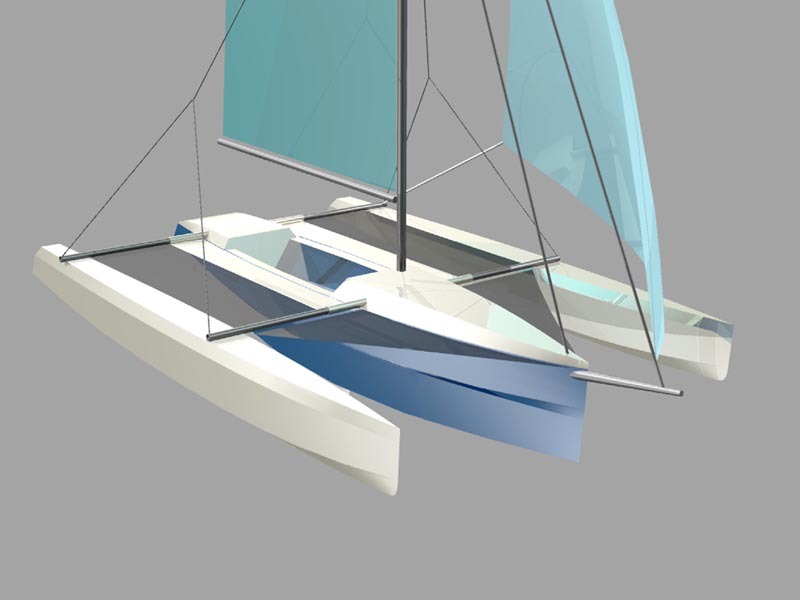 The build process uses external cradles as building supports, ensuring that the hull goes together with minimum hassle when handling the rather slender and longish hull panels. The boat is bulkheaded internally at three key points. 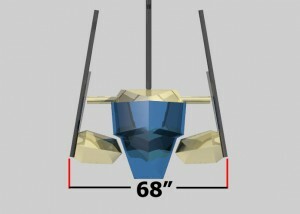 These bulkheads create not only integrated strength in the design, but they also cleanly separate the hull cavity into four unique volumes for gear storage and watertight flotation. 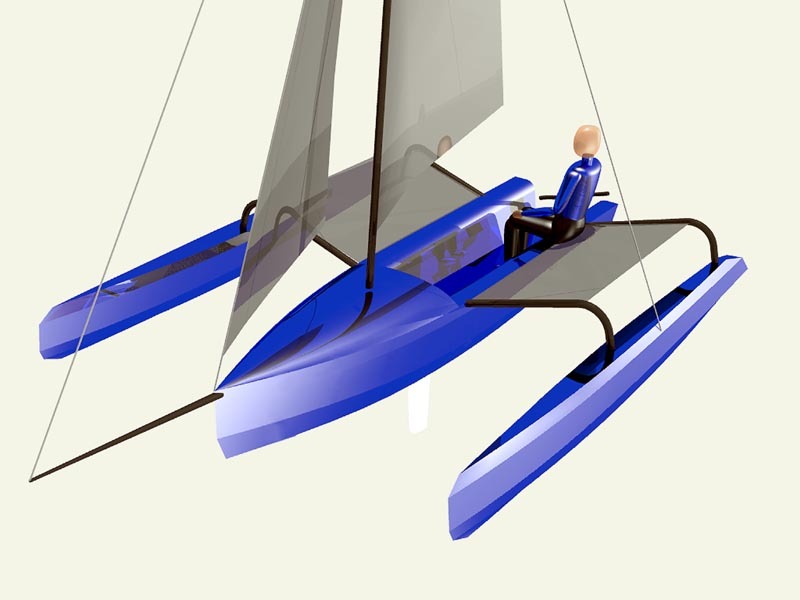 The Back Bay can be configured with a large, open tankwell set aft of the cockpit, or built with a watertight, aft hatch cover for internal storage in a conventional kayak style. Weight (est.) – 90 lbs. 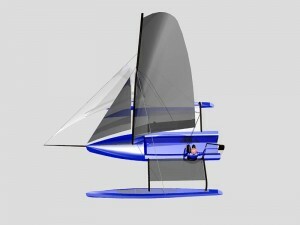 Sail Area – 56 sq. ft. 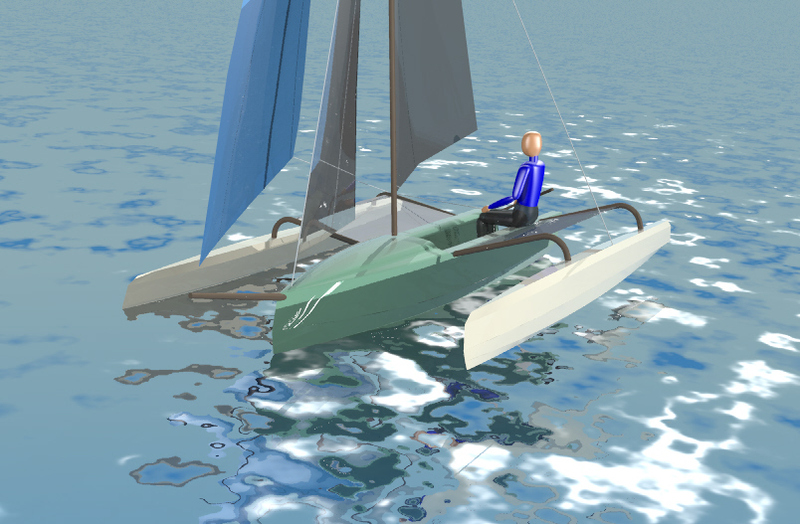 The Scorpion variant is a Sit-On-Top design for fun sailing, paddling, or Mirage peddling… or all three, as the builder desires. 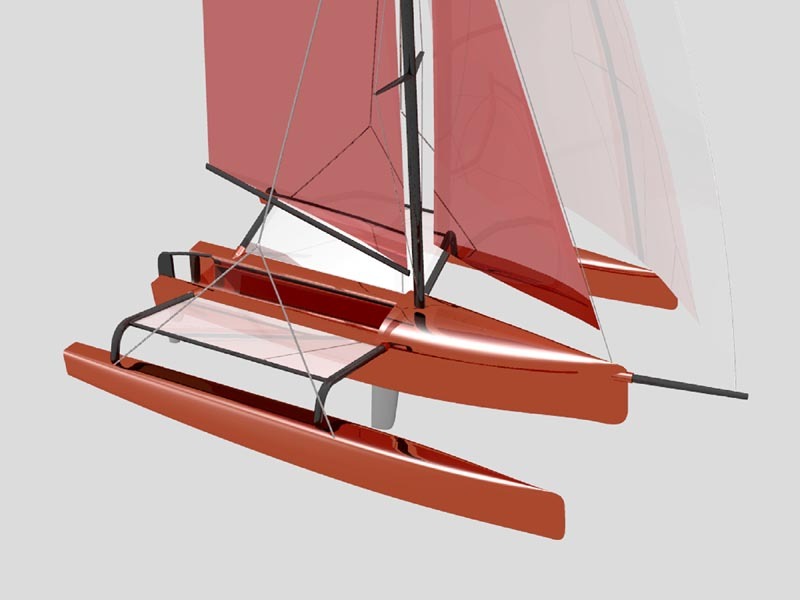 There will be a design for a leeboard mount included in the plans for those who are going to build the boat for sailing. 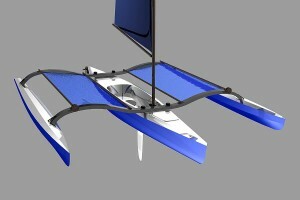 Having the aka gull wing form set well forward permits a full paddle swing arc. 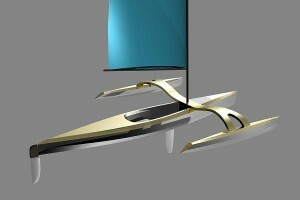 The aka beam connectives to the amas is split into a pair of mounting elements. I did this to make for a stronger, single beam mounting struture. With a single beam design, there is a tendency for the am to want to rotate around the beam, making for a very stressed component that could lead to early failure. 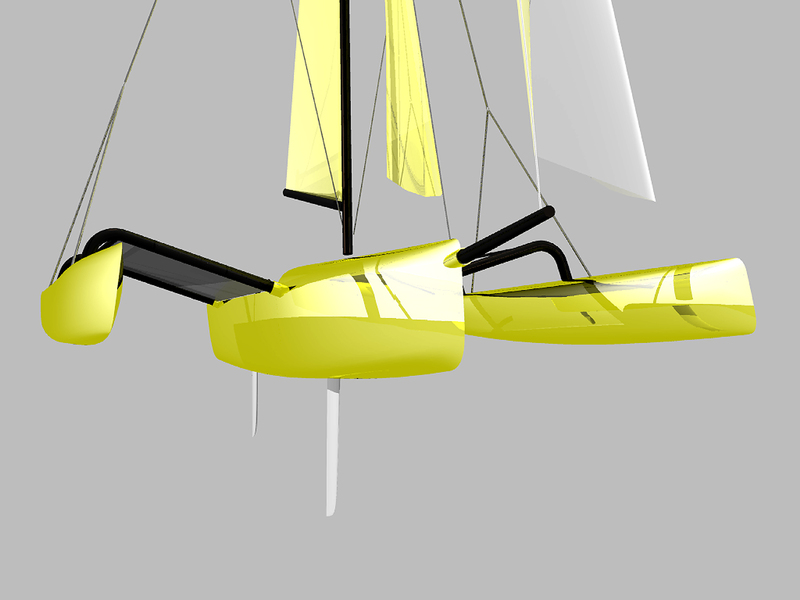 By splitting the beam and spreading the mounting points, I have given the structure more resistance to this rotational force, making for a more rigid boat in use. 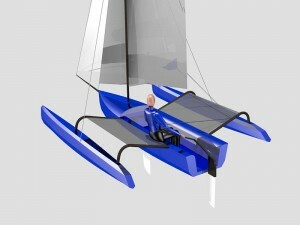 This setup will allow the owner to power sail in light air with both the paddle and the sail providing thrust. With the leeboard swung down for sailing, the owner can do some “power sailing” and utilize the Mirage drive, as well as the sail, in light conditions. The Mirage is capable of boosting boat speed enough that it creates apparent wind over the sail, adding power where there really isn’t enough for sailing alone. 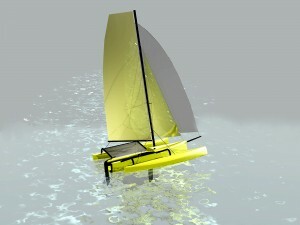 The amas are positioned to optimize capsize resistance when sailing off the wind. 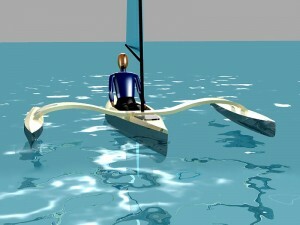 The amas do not touch the surface of the water at rest in stable trim and provide only minimal wetted surface drag when underway by paddle or peddle. As soon as the sail is loaded by the breeze, though, the ama on the lee side begins to immerse, firming-up the boat and resisting the heeling moments being generated. The aft deck can be configured as a watertight hatch with full access to the aft sections of the hull, OR a large, diving tank well with self-draining ports. The cockpit is fitted with self-drain ports under the seat as well as forward, in addition to the daggerboard slot. 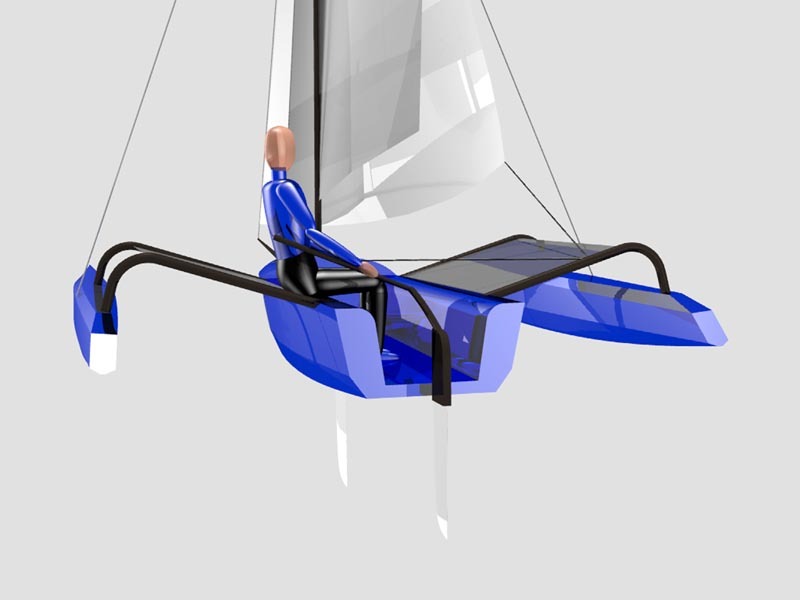 There is a watertight deck plate just forward of the seat, between the knees of the sailor/paddler to provide secure storage for critical items that may be needed on a routine basis. 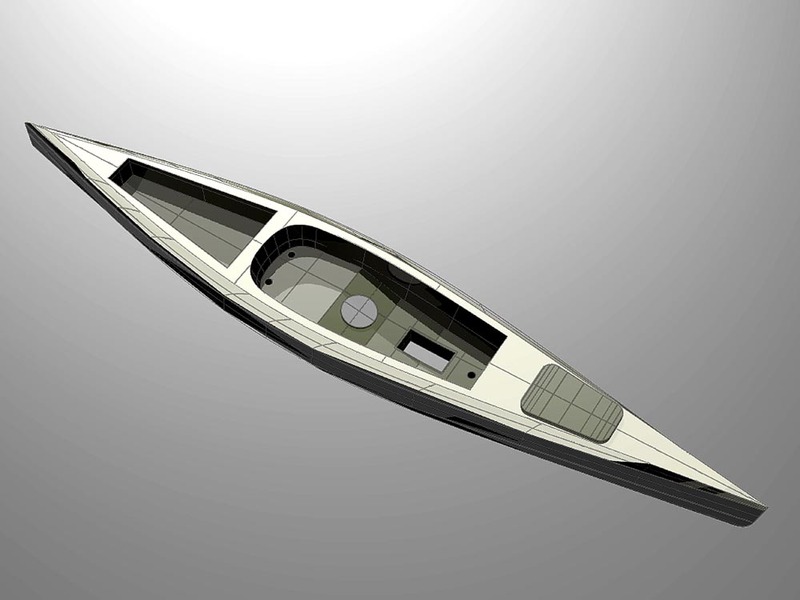 The foredeck has a watertight hatch cover for bow storage needs. 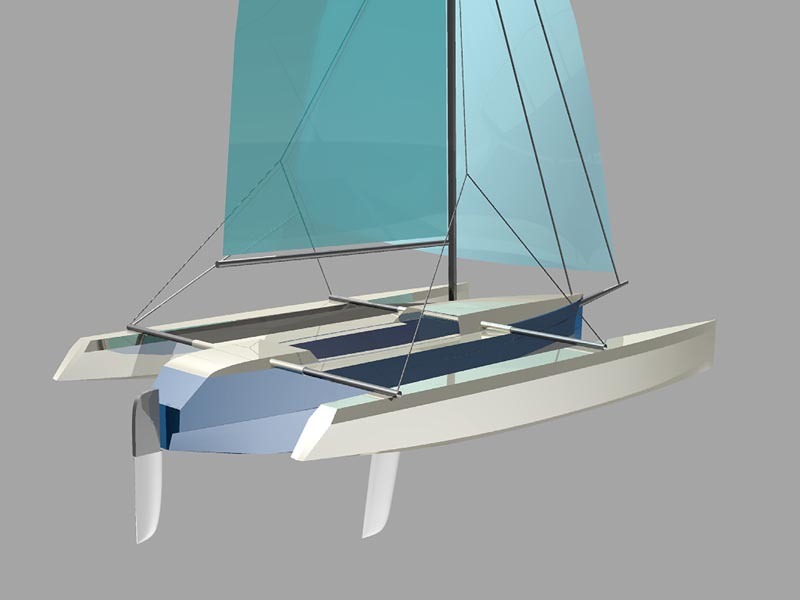 The rig is a fully battened Dacron sail with two reef points and a multi-section, self-supporting mast which steps into a sealed mast socket in the hull. 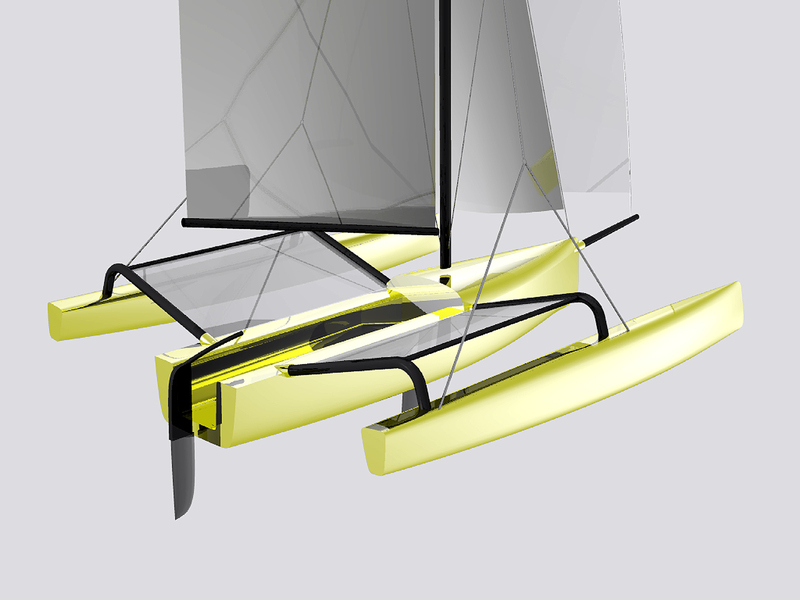 The mast and boom sections can be aluminum or carbon, as budget permits. 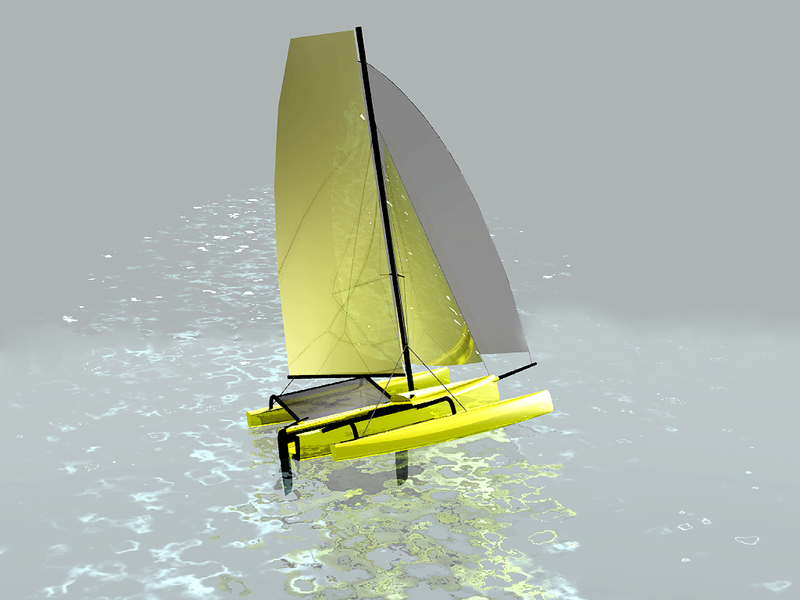 The sail choice is open for the customer as long as it can be balanced with the fixed positions for the mast and dagger board. The Cunningham is run to the deck of the gull wing aka to keep the rig on the boat in the event of a capsize. With 56-sq. ft. of sail on a 90-pound boat, this will be a decently speedy boat without being in over its head all the time in a stiff breeze. 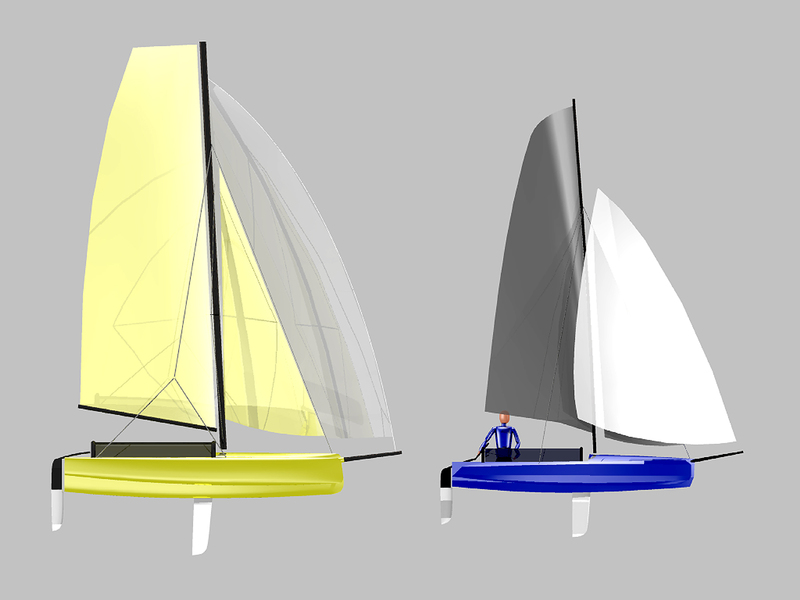 I suggest two reef points in the sail to allow for sailing in a wide variety of conditions. This will be a wet boat at speed, yet there are no worries at all for flooding and sinking, save for a truly nasty trip over a reef that shreds the entire underside of the craft. The bow, cockpit and aft hull volumes are all independent, sealed compartments, as are the ama volumes. Reentry from a swimming session will be easy with a simple, sling, or rope ladder much like those used by rock climbers, called etriers. Sliding foot pedals in the cockpit control the rudder. The rudder flips-up when it encounters an underwater obstacle, or when beaching, returning, due to bungee tension to the deployed position once past the obstruction. 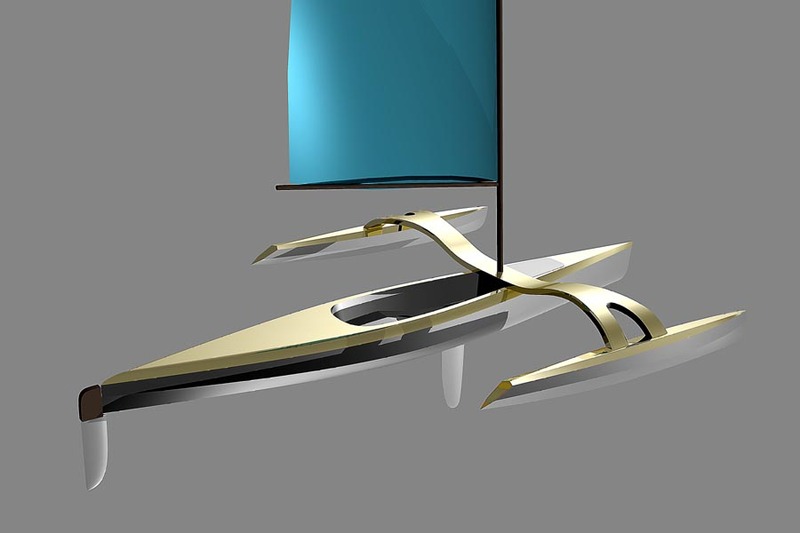 The boat is constructed in a multichine, marine plywood style with epoxy glass laminates inside and out in a stitch and glue style. Stainless T-Nuts are embedded in the hull deck surface from below to provide a secure set of mounting points for the aka wing. The amas are held in place on the aka tips by large bungees and a notched lock system. This system provides for quick setups on the beach. You just fit the aka to the foredeck, insert four, 1/4″ threaded stainless screws with comfortable, knobbed grips and screw down the aka wing. The amas slip onto the ends of the aka and you lift the pair of 3/8″ bungees up and over two raised hooks on the aka ends to secure the ama in place. Simple, easily maintained and near foolproof in operation. 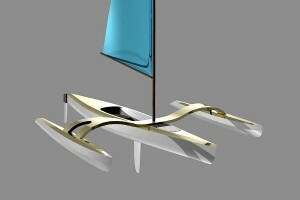 The Doubloon is the second variation on the central SOT theme of this group of boats. In this design, I am looking to provide a more expansive utility application for the base, Back Bay SOT version. 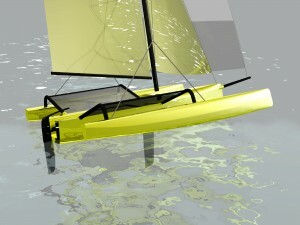 The Doubloon is essentially a solo craft and it carries the same, 56 sq. 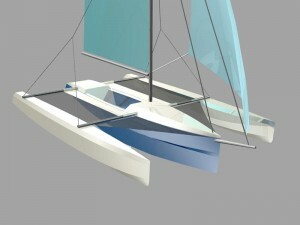 ft. sail, but the overall potential of the boat is expanded through the use of dual akas and full trampolines on both sides of the Back Bay hull. 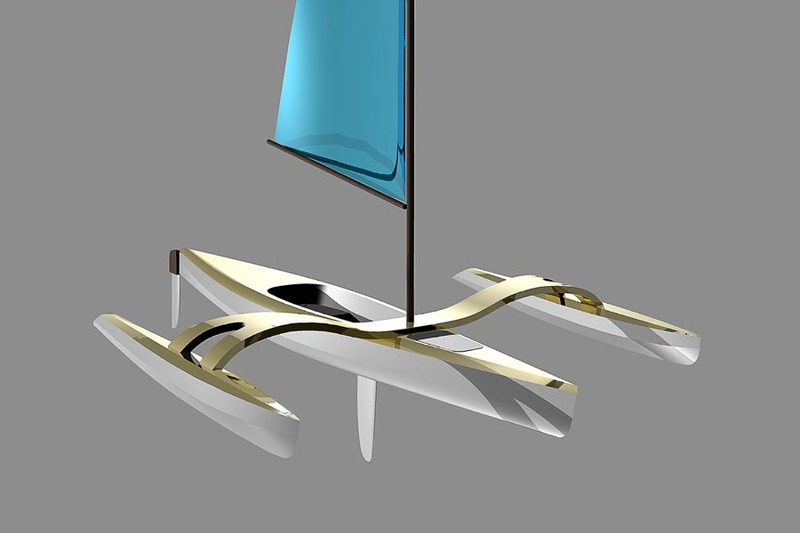 The rendering of the Doubloon shows a daggerboard inserted down through the Mirage Drive trunk, but in use, I would prefer to have the board mounted outside the Back Bay hull as a leeboard. Plans will be supplied with the leeboard solution. 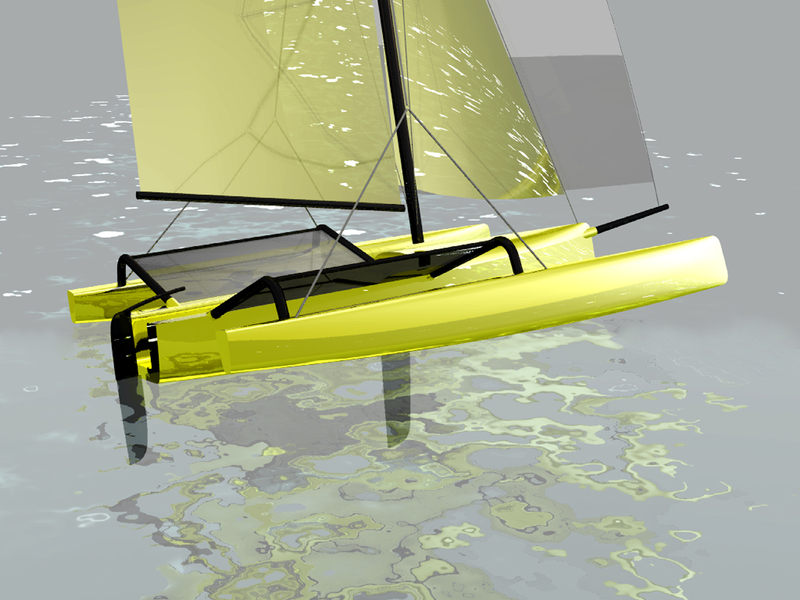 The akas on the Doubloon are spaced to allow for a full paddle stroke with the boat setup as a trimaran. There are two sections of tubing that span the opening fore and aft between the akas from which the tramp is mounted. The trampolines are designed to roll-up on the outer tube section, much like a window shade and they are deployed by an endless loop of light halyard line. With the tramps fully deployed, the inner tube section lifts up and over a holding pin in the aka and the sailor applies as much tension to the tramp as he feels he needs by hauling-in the endless loop line and cleating it off. If a paddling session is desired, he simply pops the jam cleat and pulls the line to roll-up the tramp on the outer tube section. This procedure applies for both port and starboard tramps. The aka beams are held to the deck of the Back Bay hull with the same, threaded knob strategy for quick setup and takedown times. Similarly, the amas are held to the aka ends with hefty bungee cords for the simplicity of use. There’s another, rather invisible, benefit to using the bungee cords for ama mounting. Because they are being held in place through a fairly dynamic hold-down system, the amas can move about, ever so slightly, while underway. This allows the amas to have some structural “give” and the result is that the banging and thrashing that is typically experienced by the ama, is somewhat dissipated through the flex of the joining system. The design similarities to the Hobie Adventure Island are obvious. 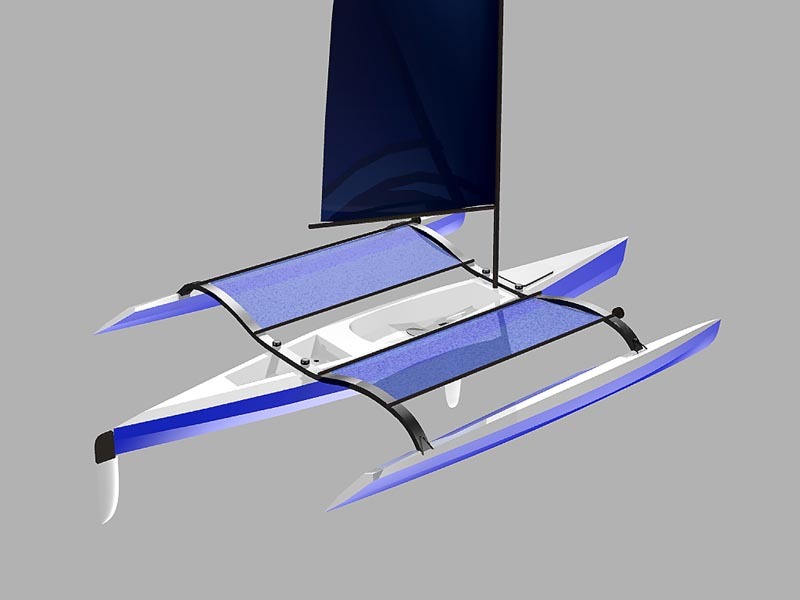 This boat, however, should be just a bit faster in the water, mostly because it will be much lighter than the rotomolded Hobie. For that same reason, it will also be easier to put it up on a roof rack for transport to the water and a lot easier on the back when you have to take it off the car to store it at home. The Doubloon configuration allows the sailor/paddler/peddler to bring along extra gear, which can be lashed to the tramps in waterproof bags. They can also take along kids, or perhaps someone special, who could lounge out on the tramp surface while lazily sailing along for a sunset cruise on a warm summer evening. All in all, I think the Back Bay SOT should be a really fun boat to own for warm water/warm weather boating adventures. It has the capacity to carry enough gear for several days out on the water. When rigged with a sailing system of your choice, it can also cover some pretty good distances if the winds are favorable. Plans for this boat and all its variations will be available from this site and Duckworks Magazine. The Solo16 S now has a bit more displacement as a direct response to suggestions for the use of a small 2 hp outboard and some spare fuel. At the same time, the vaka hull was given additional beam above the waterline and the shear was raised some to allow for mods to the amas. The amas, themselves, were made slimmer and taller, while retaining the same volume. They now have a slight vee section which gives the boat a progressive resistance increase as the amas are pressed heavily in a gust. 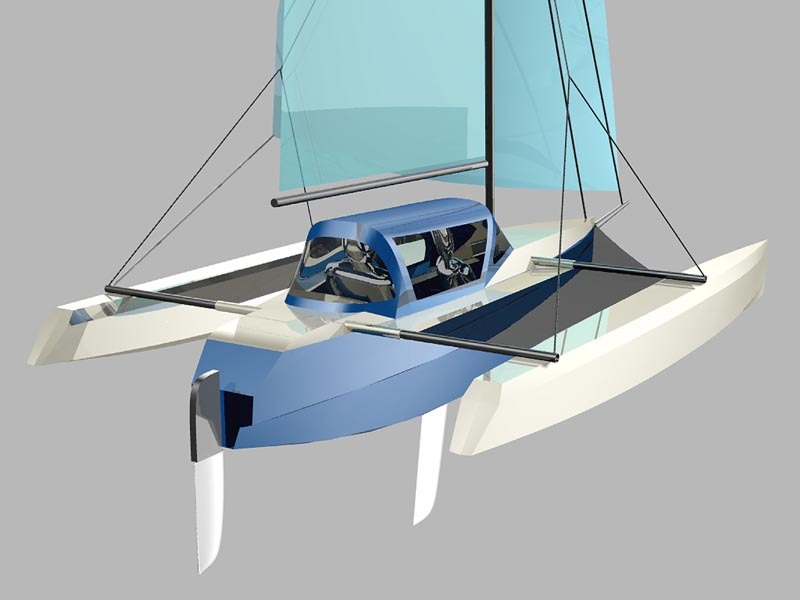 To complete the changes, a sporty all-weather soft cabin has been designed to allow the owner a chance to sail in a wide spectrum of conditions. 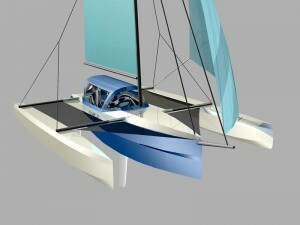 The new cabin is modular in its approach with the ability to address a multitude of sailing situations. There is a folding dodger setup forward with a large PVC window for full visibility. A removable Bimini top extends aft, covering the entire cockpit from rain and a relentless sun. 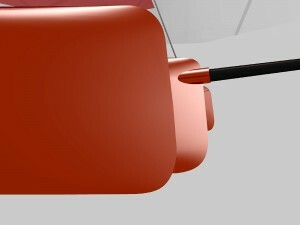 Side panels can be put in place as needed to protect the crew from hard spray, or to further enclose the cockpit. A reversed dodger is positioned at the aft end of the cockpit completing the full cabin system. All panels except the Bimini have generous window areas which are backed by micro mesh screen that is small enough to keep out the No-See-Ums. The PVC windows are zip-out removable and the screens can be rolled-up for maximum airflow through the cockpit. The complete enclosure system allows the owner to mix and match the panels as needed for the best protection from the elements. The Solo16 S is a lightweight, trailered boat with demountable amas. The aka beams stay mounted to the amas, along with the trampoline surface. The aka ends fit into composite tubes which are bonded to the vaka hull and the side hiking platforms. 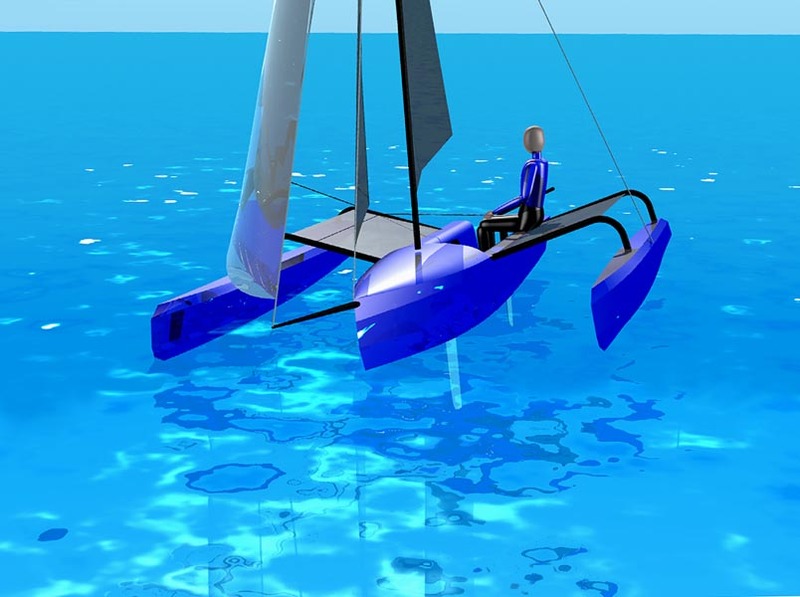 When setting up the boat for sailing while on the trailer, the owner simply lifts the ama assembly, rotates and places the ends of the aka tubes into the matching vaka openings and slides the ama into place. The akas are fully seated when their internal, spring loaded snap-buttons click into place. The entire ama assembly is easily handled by one adult with modest physical strength. 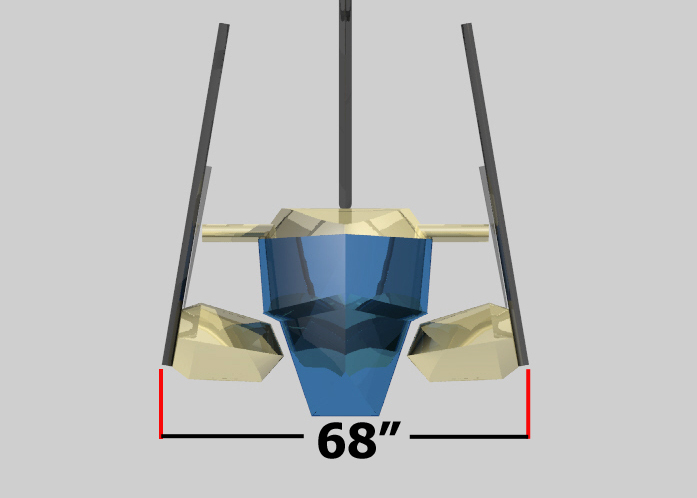 In the trailering mode, the complete boat does not exceed 68″ (1.7 m) in width, falling well under every trailer width limit in the world.